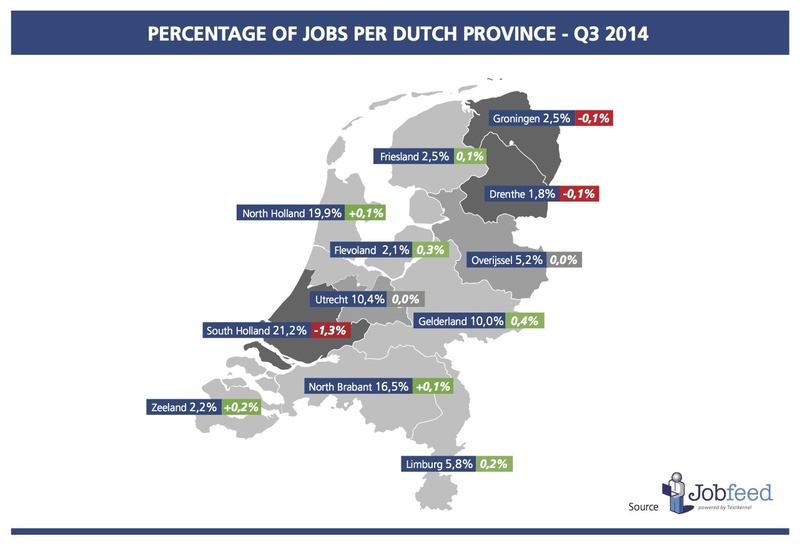 Today Jobfeed published the Q3 – 2014 index on the Dutch online job market. This index is based on the analysis of more than 1,7 million jobs postings (more than 335 000 unique jobs after deduplication) published in the third quarter of 2014 in the Netherlands and collected by Jobfeed. Jobfeed is Textkernel’s Big Data tool for jobs that collects and categorises all online jobs in the Netherlands into a searchable database. The number of jobs published this quarter has increased by 21,2% compared to a year ago (Q3 2013), which is shown by figures from Jobeed. While the number of jobs is 3,1% less than Q2 2014, the job volume in the third quarter of this year has not been this high since before 2010. 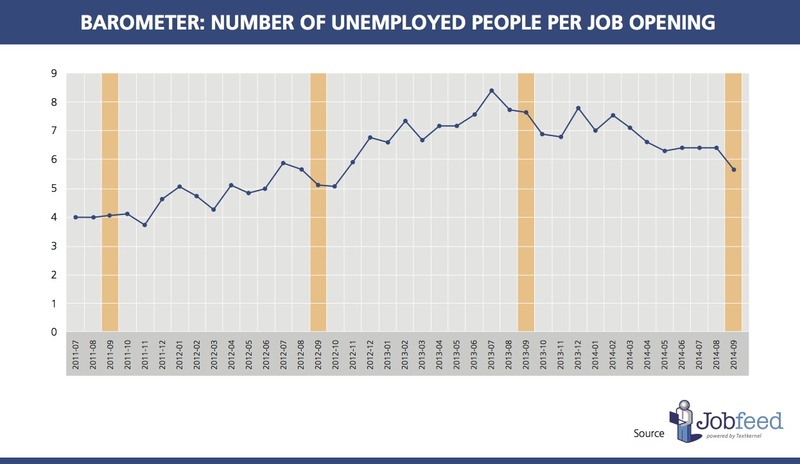 The unemployment figures that CBS (Central Bureau for Statistics) has published today, show that in September 2014 there were 8% less registered unemployed people than in 2013. Jobfeed publishes the barometer*, a monthly ratio of the number of unemployed people per deduplicated online job opening. In September 2014 the barometer shows 5,7 unemployed job seekers, compared to 7,7 in September of last year. The Trade/Retail sector remains the main employer in the Netherlands with a rise in market share over the past 2 years. 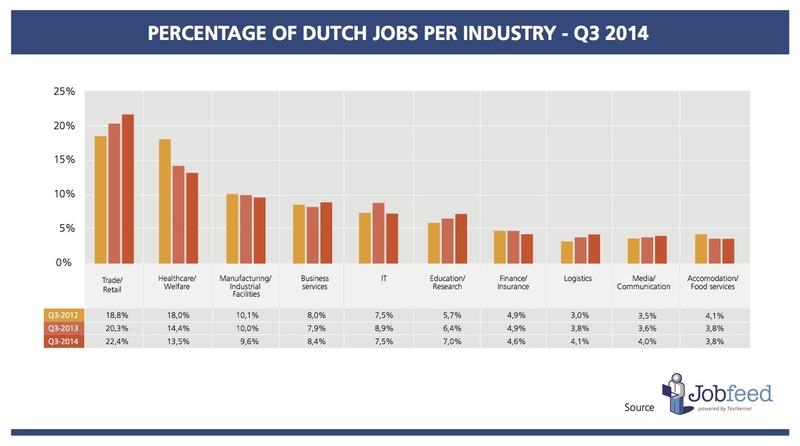 Trade/Retail now has 22.4% of all online jobs in the Netherlands. This is almost 10 points ahead of the second largest sector, Healthcare. When in 2012 Healthcare still had 18% of all jobs, this has reduced to 13.5% in 2014. IT also sees its share shrink compared to last quarter. With a 1.4% decrease, it’s back at its Q3 2012 level. The South-Holland region remains the major employment area in the Netherlands with 21,2% of all online jobs, despite a 1.3% decrease of its share of the online job market. Gelderland increased it’s market share with 0,4% to ten percent of all online jobs in the Netherlands. The top 5 profession classes shows hardly any changes. IT still tops the list with 13,4% of all online jobs published in Q3 2014. This is a decrease of 0,6% compared to Q3 2013, but is 0,1% higher than last quarter. Healthcare also drops by 0,6% to a market share of 6,7%. IT does grow with 0,2 percent compared to the previous quarter. This index is also available for the German and French market. For news on the job market, register for the newsletter. Numbers come from Jobfeed, the labour market analysis tool of Textkernel, that collects and categorises all online jobs and makes them searchable. Each quarter, Jobfeed will provide the latest statistics on the online job market. 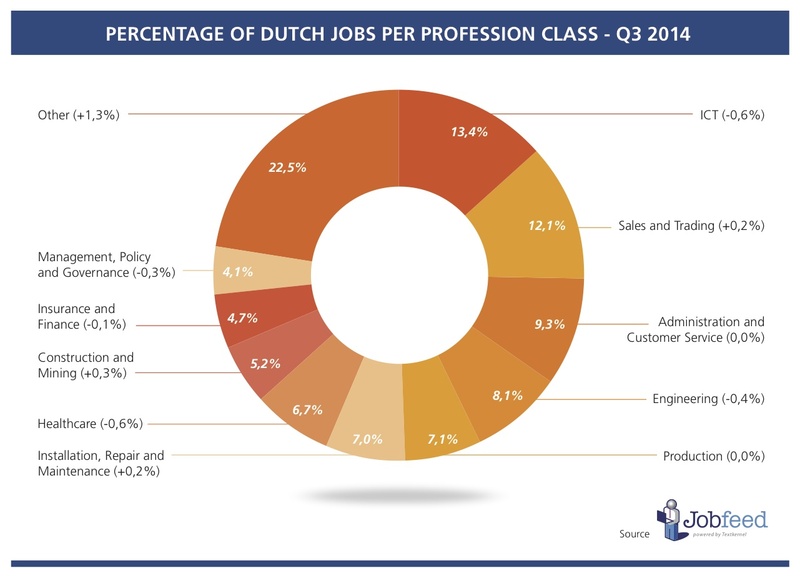 For this analysis 1,7 million Dutch job ads, posted between 1 July and 30 September 2014 have been analysed, categorised and deduplicated. Over 308.000 unique jobs, excluding internships, remained and are the source on which these analyses have been performed. * De barometer is a monthly ratio of the number of unemployed people per deduplicated online job opening. From this edition onwards, the barometer uses the not-seasonally adjusted unemployment figures of CBS and the unique, deduplicated jobs from Jobfeed, excluding internships, side jobs, franchises and volunteer work.